Fitness apps are prevalent, with more than 300,000 on the market, but a recent study questions the efficacy of these technologies. Researchers did a meta-analysis, looking at data from six studies out of a total of 6,000, to find out whether smartphone apps increased physical activity. They found that people who used apps averaged 476.75 steps more per day than those in the control group, who did not use apps. The researchers concluded that this difference was nonsignificant. They also found that physical activity apps were more effective in the first three months of use and that when the apps focused solely on physical activity, versus physical activity and diet, they were more effective. More than two in three adults are considered to be overweight or obese. Numerous health conditions such as high blood pressure, high cholesterol, diabetes, joint problems, and heart disease are attributed to being overweight or obese. One of the main factors for many people who are at an unhealthy weight is a lack of exercise. Fitness apps, which promote movement, are seen as a way to put exercise front and center. However, this study gives pause to whether the apps really work. Although researchers found the difference between those who used fitness apps and those who did not to be nonsignificant, the cumulative step difference over a period of time can be quite large. If a person takes 476.75 additional steps per day, they will take an extra 174,013 steps over the course of a year, which is equivalent to nearly 7,000 calories burned. The study found that physical activity apps were more effective in the first three months of use, with usage decreasing over time. During this period, participants using physical activity apps increased their step by 2,074.96 per day. Unfortunately, this well-being phenomenon is not unique to fitness apps. Two in five people quit their diet in the first seven days and one study found that 73% of people who set fitness goals as a New Year’s resolution give those goals up, with half giving up within six weeks. With this context, a question this study or future studies should explore may be how are fitness apps help people stay on track for that long? 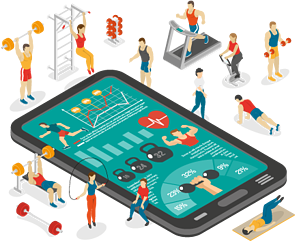 The researchers from the app study acknowledged that the size of the study was small and that more reviews are needed, since few high quality studies have been done on the effectiveness of smartphone apps on physical activity. Many companies use fitness apps as part of their corporate wellness offerings. Does this study imply those efforts are futile? Not at all. In fact, the study highlights that fitness apps can work, but people need more than an app to get into the habit of consistently moving for the long-term. In other words, they need an app that is supported by a wellness program that encourages activity through a number of means, including wellness challenges. 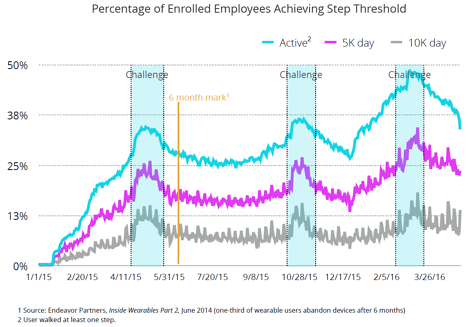 A study published by Jiff found that employers could keep Fitbit users engaged much longer through periodic corporate-sponsored wellness challenges. In addition to offering wellness challenges, the study suggested that companies could provide subsidies for wearables and deliver action-based rewards, both short- and long-term, that spur participation. Although users may initially be excited about using a new app, it is understandable that to sustain that enthusiasm, they need the support, encouragement and recognition that comes with a formal program. When fitness apps are not standalone products and part of a bigger wellness program, they offer the best opportunity for continued compliance and success.